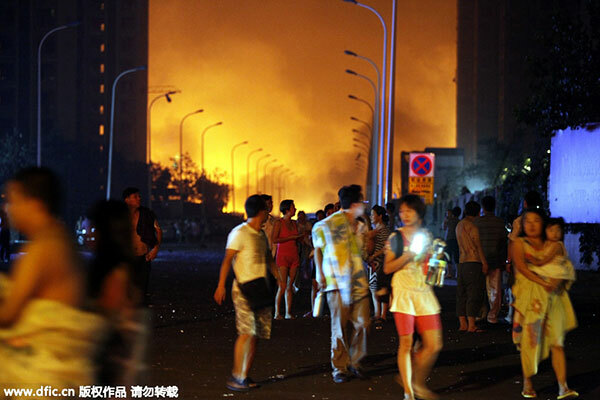 At least 44 people were killed and hundreds more injured by a series of enormous explosions at a hazardous materials warehouse in the northeastern Chinese port city of Tianjin late Wednesday. 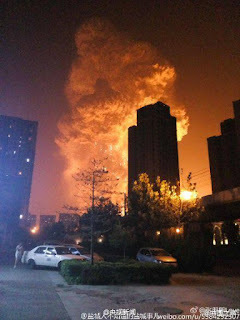 Pictures and videos showed gigantic plumes of fire and a mushroom cloud that dwarfed nearby high-rise buildings and sent a massive shockwave that rattled residents several kilometers from the blast site. 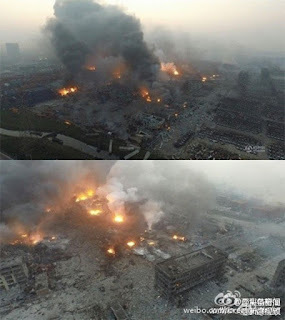 Aerial footage posted Thursday by the official Xinhua news agency showed a still-smoldering center of destruction that stretched for multiple blocks, leaving behind hollowed-out buildings and charred vehicles. 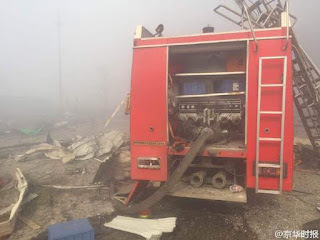 Hundreds of firefighters are trying to contain the blaze, but their efforts have been complicated by "complex conditions" at the site, according to Xinhua. Several reports have suggested firefighters have had to suspend their efforts until it can be determined there are no more dangerous chemicals present. State media say at least 32 people remain in critical condition after the explosions. At least 400 people were injured. 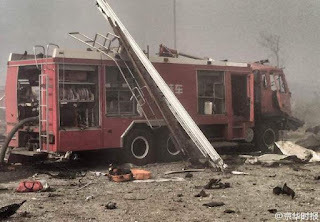 The first explosion, which took place just after 11:30 local time, was equal to three tons of TNT, according to the China Earthquake Networks Center. A second blast 30 seconds later was equal to 21 tons of TNT, it said. The explosion blew out windows and rattled residents up to several kilometers away. "There was one gust of wind, an unnaturally large gust, and then a really really large gust followed by a bit of a shake," Drew Chovanec, an English teacher who lives about five kilometers from the blast, told VOA. "We saw the plume of smoke and the light pretty clearly afterwards." 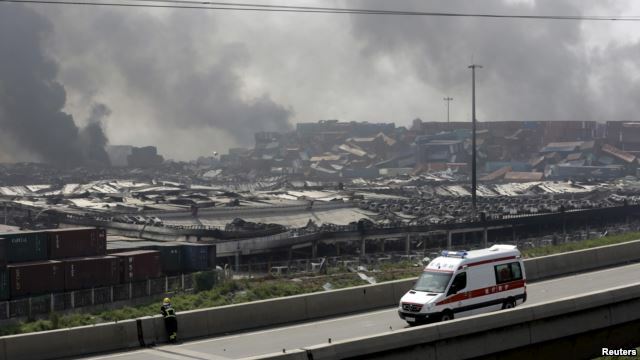 There are no indications about what caused the explosion, which state media say occurred at a warehouse owned by Rui Hai International Logistics. Local authorities say the company's senior management have been taken into custody. Tianjin is a port city in northeastern China, about 150 kilometers southeast of Beijing, and is home to more than 7 million people. It is China's fourth largest city. 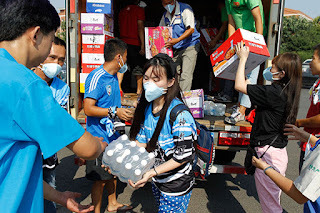 Emergency supplies are rushed to the blast site. A State-level rescue team against nuclear, biological and chemical weapons (NBC weapons) from Beijing left for Tianjin at 11:00 am on Thursday to help detect the fire, treat the injured, handle the hazardous chemicals, and maintain the order. The team consists of 214 officers and soldiers from Beijing military area. 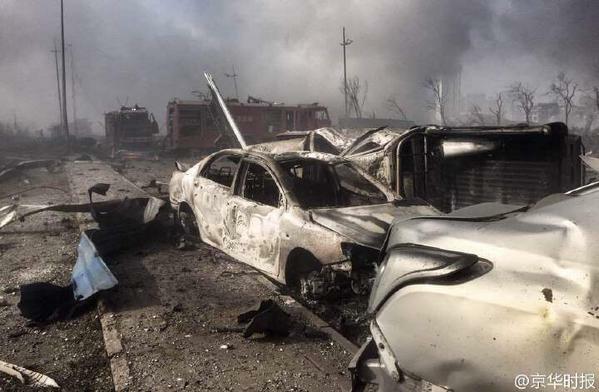 Tianjin has installed 12 temporary monitoring stations near the blast site in Binhai New Area to monitor the air quality after the series of explosions, in which some pollutants like toluene exceeded the national standards, Tianjin Daily reported. 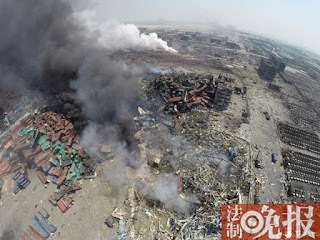 The samples collected at 5:30 am on Thursday showed that the concentration of toluene,widely used as an industrial feedstock and as a solvent, has reached 3.7 milligrams per cubic meter in the air, higher than the national standard of 2.4 milligrams per cubic meter, the report said. 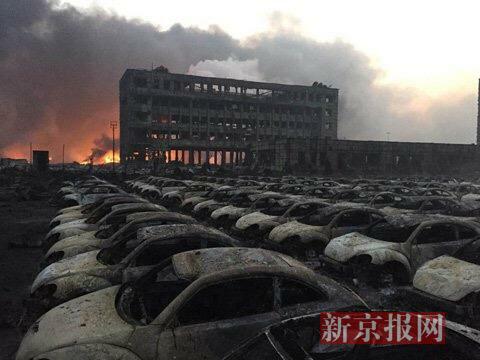 Besides, the concentration of volatile organic compounds and major air pollutants, were 5.7 milligrams per cubic meter, also exceeding the Tianjin municipal standards (2.0 milligrams per cubic meter). But other major air pollutants under regular supervision like sulfur dioxide, carbon oxide, and PM2.5 and PM10 particulate matter did not see a rise in concentrations as of 11 am). The drainage outlet to the sea has been closed and the environmental authority is conducting an investigation into water quality, the report said. A stevedore from Ruihai Logistics Co Ltd, the company responsible for the safe handling of dangerous goods at the port, told a reporter from cnr.cn that he dodged the blast as he was out to buy snacks for his colleagues and himself. He said he has never had any training on how to deal with hazardous chemical substance. 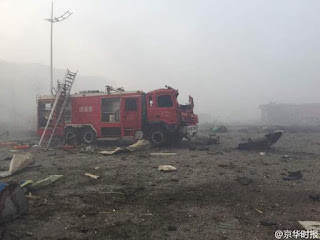 China's Public Security Minister Guo Shengkun arrived at the blast site in Tianjin to direct rescue operations and visit the wounded, making the first priority to ensure the security of the people's lives and property. Guo arrived in Tianjin at about 5:00 am on Thursday and immediately went to the blast spot. 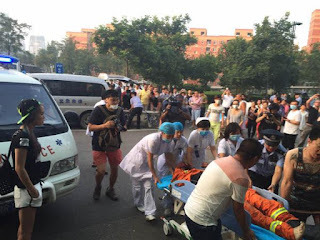 He said the blast has caused serious casualties and great concern from Chinese leaders and people. Authorities must "convene every resource available and take every measure that can be taken" for the rescue and emergency handling, Guo said. Guo paid a visit to the wounded in hospitals and asked medical staff to spare no efforts in relieving their pain and to cure them as soon as possible. 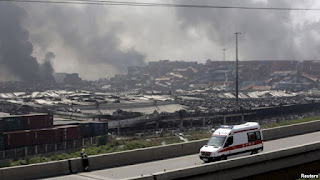 As of 12:00 pm, death toll has risen to 44, including 12 firefighters. About 520 have been admitted in hospital, among which 66 people are severely injured. Beijing News said chief of the company that stored hazardous material has been taken into police custody.